In a nutshell, turbines are just the opposite of electrical fans. As you apply electricity to a fan, its blades start spinning at a high speed which creates turbulence in the immediate front. But what will happen if you can somehow create turbulence in front of the fan so that its blades can spin at high speed? It will obviously generate electricity. The same principle is applied for making wind turbines. Of course, there are a few other components to make the units fully workable and I will soon explain all the details so that you may build a unit for your home all by yourself. 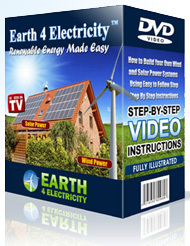 But first of all, I may tell you how to build your own wind power system in your home. Visit a nearby hardware store to pick up a small electric DC motor that is not too heavy. Spin the spindle a few times to see if it runs freely. Also, check the rated rpm that is printed on its base plate. Select the one that has the highest rpm printed on it. Now is the question of making the blades. These may be carved out of solid wood which would be too heavy. Saw out, instead, from a 6” ABS pipe that is at least two feet long. Cut lengthwise into 4 pieces, they serve pretty well for your wind turbine. Of course, the turbine will need 3 blades while the 4th blade may be kept aside as replacement when one gets damaged during the trial run. You may have to take a few more trips to the hardware fellow to get hold of a suitable hub for your wind turbine. Select one that fits the motor’s spindle and bolt all three blades, keeping the same slant for all three. Your next trip to a junk shop would be to collect a workable battery for the unit. You need not have to go for a new battery since it will always remain charged as long as the turbine rotates. Next you will need an electronic control system which will switch the turbine power from the battery to any dummy load or to the grid directly. An over charged battery will not last long. As the unit is now ready for operation, get hold of 1.25” conduit that is at least 10 foot long and some guy ropes to fix it on the ground. The turbine would be fixed at the top of the conduit facing the wind. Select a site where the wind is stronger and fix the contraption well. Some length of electrical wires would now be needed to connect the turbine with the battery and finally to your home. And this precisely is how free wind power for your home can work wonders for you! So are you interested in free wind power for your home? Well, when it comes to your power bills, you will see such a drastic reduction that it will feel that it is almost free. Also consider the fact that wind power system maintenance costs are almost free as well. Plus it is hassle free to set up. Being a safe and clean energy, you will also be able to contribute to clean up the environment. With some information, you can also go for wind power. All you need to know is a few simple things like where to set up the system in the home so that you can get the desired results and how to do it, how to wire the system, where to get the parts from and of course the safety precautions that need to be followed.